THIS statement of renowned English poet and essayist Samuel Johnson, as quoted by his biographer James Boswell in his book The Life of Samuel Johnson, is no truer now than when it was first uttered centuries ago. Like many other Filipinos, I was glued to the TV screen last Tuesday as the Senate blue-ribbon committee opened its investigation into the controversial ZTE broadband deal, now estimated at $340 million. 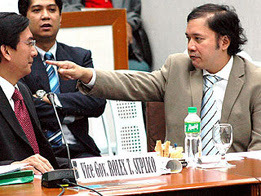 I was riveted to the unfolding drama as Joey de Venecia, or JDV III as the media has dubbed him, answered the senators’ probing questions into the so-called national broadband network project, or NBN, the contract between ZTE — a leading telecommunications company in China — and the Philippine government, and the alleged anomalous, not to mention scandalous way, by which the contract was hatched and signed. Too, JDV III did not mince words in identifying the key players in deal, dragging the name of Comelec chairman Benjamin Abalos and even that of First Gentleman Mike Arroyo into the sordid affair. It was interesting to note that there in that esteemed hall of the Upper Chamber, JDV III, the son of veteran politician and House Speaker Jose de Venecia Jr., faced off against several notable “sons” of politicians as well: Mar Roxas (of the late Sen. Gerry Roxas), Alan Peter Cayetano (the late Sen. Renato Cayetano), Chiz Escudero (former congressman and agriculture secretary Salvador Escudero), Noynoy Aquino (the late Sen. Ninoy Aquino) and Jinggoy Estrada (former President Joseph Estrada). Only JDV III did not follow in his father’s footsteps and, until a couple of weeks ago, was largely unheard of, working quietly in the IT industry. Well, I’m sure we’ll be hearing more about his background as the administration cranks up its rather amateurish crisis PR group. I’ve already received several text messages from a 0927-4868279 (Hello NTC!) alleging all sorts of improprieties in JDV III and his father’s past. True or false, they have no bearing, though, on the issue at hand. Society takes fatherhood as the ultimate expression of a man’s masculinity. And to have a son is the proudest moment in any father’s/man’s life. Despite this era where women have emancipated themselves at home and in their careers, proving that, yes, they are as worthy or useful as men are, a father will always long for a son rather than a daughter. In a son, a man can count on the survival of the family name and the continuation of the bloodline, so to speak. Naturally, a father sees himself in the son and tries to nurture him to grow up to be “just like Dad.” Many fathers take so much pride in having sons as their first-borns that they even name their babies after themselves. Thus, we have the Juniors or the Thirds around us. One can only hope that they live up to their father’s names. Because for every son that has achieved or surpassed the accomplishments of his father, there are a few who have failed, bringing shame to their fathers and their families. When a father is successful, his own family and society in general put a lot of pressure on the child to reach the same heights as he did. Such pressure further complicates the bond between a father and his son. And so as I watched the Senate hearing, there was JDV III politely answering the pointed questions of the senators. But it was obvious that the most difficult inquiries he tackled were those regarding his father, the House Speaker. He looked even slightly choked up as he confessed that his only regret in coming out and telling all about the ZTE deal, was that his relationship with his esteemed father was now suffering. It is never easy for a son to try to stand up for himself and try to do different from what his father may have done if placed in a similar situation. The consummate politician that he is, I would think Joe de V, if in his son’s place, would feverishly try to work out a compromise with Abalos and ZTE. He is one who tries to smoothen any ruffled feathers, especially those of his colleagues. For JDV III to disregard his father’s advice and risk disappointing the latter can be a gut-wrenching decision any son can make. 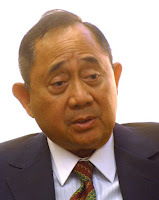 Did anyone notice how JDV III’s face lit up, and how his eyes sparkled like a little boy’s, as he spoke of how proud his father was that President Arroyo had cited his proposal in a favorable light, telling Abalos to tailor ZTE’s bid in a similar fashion? Young or old, a son will always keep courting the approval of his father. In an interview after Tuesday’s Senate hearing with the news channel ANC, JDV III said that his father was going out of town intimating that he knew not where their relationship was headed. For now, we are just observers in the side drama on the Speaker and his son, JDV III. It may not be as gripping as the spectacle between Ruffa Gutierrez and her mother, the feisty Annabel Rama, but it is interesting nonetheless in the context of realpolitik. The Speaker is still safe in his seat, but if push comes to shove for the President and her husband, and Joe de V’s position is threatened, it would be intriguing to find out how the latter plays his hand. In an interview on Wednesday, however, Joe de V said he was cancelling his trip to Rome and is standing by his son. However, he has yet to corrobate his son’s testimony regarding three instances where the Speaker may have witnessed certain events and heard statements made by the key players regarding the ZTE deal. As any politican will tell you, sometimes it is difficult to choose between duty to family and duty to country. Or in this case, to his President. Will Joe de V choose his political survival over his son? Abangan.